Hand Feeding. This is where you perform some variation on you holding the feeder and the chameleon shoots it from your hand. You simply open the door, present the food and wait. 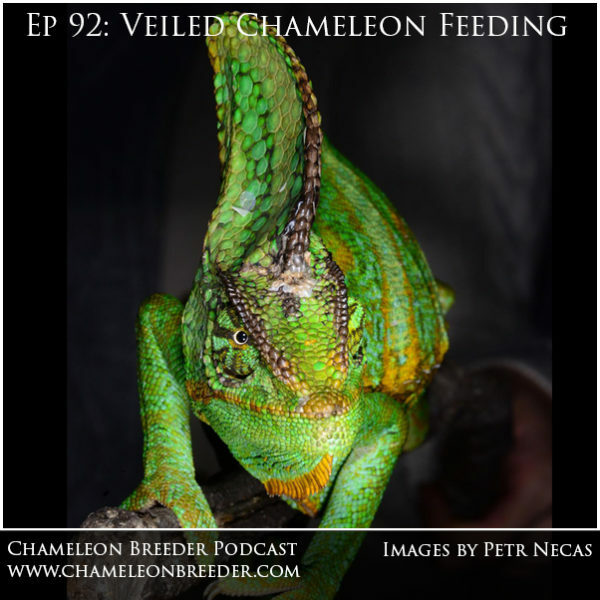 If there is hesitation then try closing the door enough that you can put it between you and your chameleon so there appears to be barrier between the two of you. Chameleons learn that a closed cage means they are safe. This can help them feel safe around your hand. 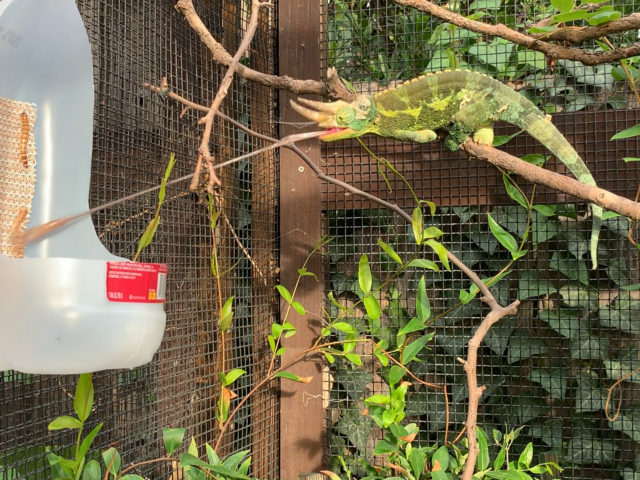 As can be seen by this image, using another item may help the chameleon feel comfortable with being hand fed. Of course, this works only for feeder items like grubs that can’t easily run away! Hand feeding is the same for any cage type. With cup feeding you will need to find a way to mount the cup up with the chameleon. How you do this depends greatly with what you are using for a cup. 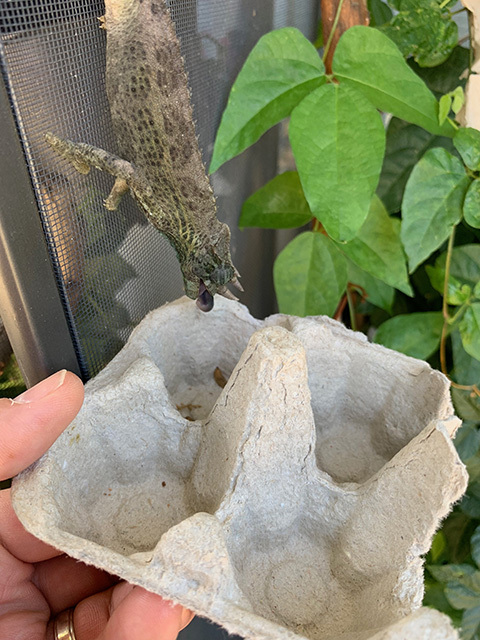 If you are using a Feeder Run Cup with a hanging hook then t gets very easy to hang it off of any of the Dragon Ledges that come standard in all but the smallest of cages or from branches in the cage. If you are using a feeder run cup that affixes with a magnet you will have to bring the cup and holding magnet together to sandwich the cage side. People using commercially available feeder run cups have been confused that the holding magnets do not stick to Dragon Strand screen walls. This is because our sides are made from aluminum. Anything a magnet sticks to will rust and Dragon Strand cages are rust proof! 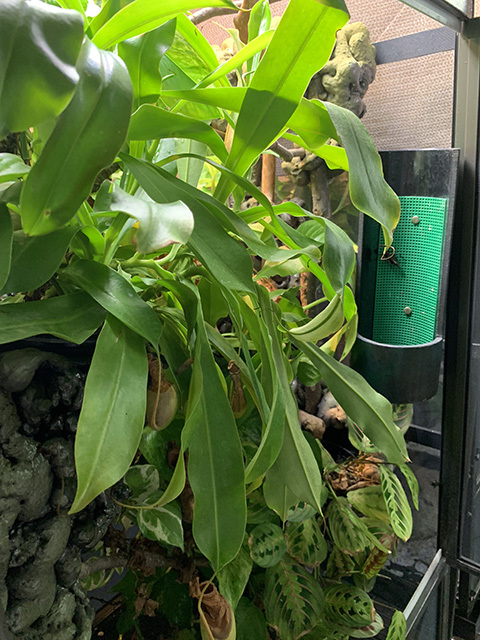 The PVC walls of the Breeder series may be too thick for the magnets to have a solid hold so mount the feeder run cup on the top face panel. If you have a Medium Tall/Wide Breeder you will not have that Top Face Panel. You can mount them to the main door, but please do so close to the hinges where there is the most strength.